Royal Events by Melissa has paired up with Ritz Charles, BBJ Linen, and A Classic Party Rental to create a wedding table at the Carmel Monon Center. This was the early summer 2010 look inspired by a vintage Hollywood glamour theme. 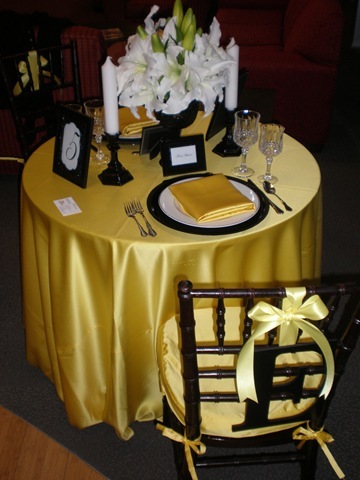 Yellow Lamour linens by BBJ Linen. Chiavari chairs, stemware, plates, and flatware from A Classic Party Rental. The inspiration board was created at Style Me Pretty.